Darjeeling: The Gorkha National Liberation Front, which is looking at resurrecting its support base in the hills, has decided to start from tea gardens. The GNLF had recently dissolved at its central committee, branch committees and all frontal organisations expect for its garden workers' union and ex-serviceman association. The party, which is now part of Joint Forum- a conglomeration of 23 trade unions apart from the TMC, is trying to take the lead on the issue of fixation of minimum wages for tea garden workers. The Morcha's union, Darjeeling Terai Dooars Plantation Labour Union (DTDPLU) is also part of the Joint Forum but they have preferred to lie low within the front. For the past few days, GNLF leaders, including J.B. Tamang, president of Himalayan Plantation Workers' Union has been personally addressing gate meetings in various tea gardens. 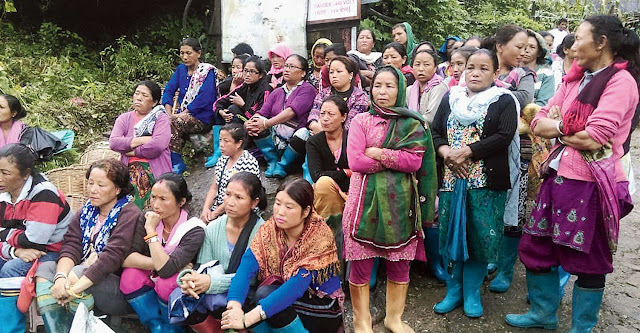 "Since August 1, our party has organised gate meeting at the tea gardens situated in Manju, Phuguri Geille, Nagari, Dhajea and Chamong where the president of the party's trade union, J.B. Tamang, was present," said a GNLF leader. Tamang said that the meeting was organised after the July 30 meeting on fixation of minimum wages was postponed to August 6 by the state government. All political parties are in support of minimum wages but the GNLF clearly seems to be in the lead on this issues in the hills, knowing well that the it can get huge political mileage on the issue. More than 55,000 permanent workers apart from 15,000 temporary workers work in the 87 hill gardens that can sell their produce as "Darjeeling Tea." In the gate meetings, Tamang is taking the predominant Gorkha Janmukti Morcha head on accusing them of working against the benefit of the workers. "Tamang is raising issues like non-compliance of 26 week of maternity leave, delay in disbursement of gratuity benefits and has accused the Morcha of collecting donations from the workers in the name of 'fighting fund', "bonus fund" and to support Gorkhaland Personnel (a wing of young boys and girls raised by Bimal Gurung) in his speeches at the gardens, apart from working closely with the management against the interest of the workers," said a GNLF source. The allegations against Morcha mostly pertain to the time when the party was under Bimal Gurung. After a change of guard with Binay Tamang taking control of the party, many functionaries of the Morcha's trade union, including its president, has been changed. "The GNLF is sensing an opportunity to connect with garden workers," said an observer. The Gorkha National Liberation Front, which is looking at resurrecting its support base in the hills, has decided to start from tea gardens.